So I am about at my wits end trying to track down this P0340 code (cam sensor) problem. This all started 6 or more months ago, I did the usual sequence of things: replace the sensor (got a bad one and then replaced it with a known working one), checked the wiring for breaks, cleaned the connector at the ECU (had some cr@p in those pins), and replaced the connector at the sensor. At various times, I thought I had this fixed, as the CEL would stay off for 100's of miles; but eventually it comes back on and its always a P0340. Now when I clear the code, it stays off for somewhere between 2 miles to 70 miles or so. No particular pattern as to how long it stays off or what causes it to reappear. Engine does not seem to run any different or start any different with the CEL on or off, but I would like to get to the bottom of this. I was wondering if anyone here really understands what causes the ECU to throw a P0340. Is it a loss of signal from the cam sensor, cam out of time with the crank, is it checked just at startup, all the time while running, does it need to accumulate a certain number of faults to set a P0340 or will just one do it? There is info online about this code, but I have found some of it to be inaccurate so I am not sure what to believe. If someone here knows which issues will generate this code, I'd sure like to know. Also, I have been working with Torque Lite and an OBDII-BT reader, so not much info. I was wondering if a DRBIII (or whatever the dealer tool is) would give more info. I know some of the better readers for other makes will tell you things like shorted or open sensor lines and stuff like that. If a DRBIII would tell me that, it would be a great clue. I have been approaching this as an electrical problem (which it usually is): bad sensor, wiring, connectors or the like. While I certainly could have missed an frayed/shorted wire somewhere, I am starting to wonder if perhaps this code is coming up because of say play in the Tbelt causing the cam timing to shift (although I would expect to hear and feel power issues if this were the case). Am I just being paranoid here, or might there be a connection? Also have considered that perhaps it is the crank sensor which is off but it shows up as a cam sensor error (assuming as I have read that the cam sensor only checks that the cam is in time with the crank). Is this worth pursuing? Anyway, I am about to throw in the towel on this and bring it to a dealer (or preferably a known good CRD wrench). Just hoping some of the experts here have some ideas for me to try before I do that, or at least can tell me what sorts of problems can cause this P0340. During engine cranking and with the engine running. Battery voltage greater than 10 volts. no camshaft position sensor signal. Three good trips to turn off the MIL. Circuit pin numbers and troubleshooting steps are outlined in the factory service manual, which is online. I wonder if you could attach something like a noid light to the cam sensor connector? With the engine running, watch the pulses while wiggling the wiring harness and connectors. If the sensor is good, then the problem is wiring. Most likely the connector at the sensor. I’d start by splicing in a new connector. Flash - I had replaced the connector at the sensor end. It looked pretty chewed up, but the new one hasn't helped any. Will get my hands on an oscilloscope this week and take a look at the signal during idle to see how it looks. Gord - Found the section in the FSM for this code with the diesel engines (9-906 to 921), thanks. Looks like the factory diag tool does offer a bit more info, but until I can find a place to run that, I went thru the diagnotic steps as best I can (some like checking for open/shorts between the ECU and sensor I had done before and some can't be done without the factory diag tool). No shorts or opens on any of the wiring, pretty much everything checked out, except a couple of the resistance settings, measuring thru the wires and the ECM. Basically test steps 12, 14 and 15 all fail, with the corrective action being to replace the ECM. I will retest this later in the week, after I get a better VOM (I've just been using a HF cheapie) to measure resistance, and after I check and clean the pins on the ECM connector that go to the CMP, since those could be a source of high resistance. I guess this has narrowed things down a bit, but I am hoping that is isn't the ECM (seems odd that it would just go out like that, but perhaps that is wishful thinking). Anyhow the oscope and better VOM should narrow this down some. The one other possibility would be that the TBelt is on the edge of its adjustment, and there are legitimate times when the cam signal is not coming in during the correct window. If this were going on I'd want to ease off driving it until I could re-time it. Anyone have any idea if/how likely this is (I will run the timing pins in just to see if they line up, but can't do it until better weather). Just in case I find out the worst on the ECM, anyone have a spare, working ECM they are looking to sell? One more helpful tool for when you are doing electrical diagnostics is a set of "Bed of Nails" alligator clips. These allow you to perform tests without the connectors undone, as well as testing without destroying wiring insulation. Did not have any of these; ordered a set directly from AST (w/free shipping) to add to my menagerie of electrical tools. Gotten a bit further, but still no answer. Borrowed a high quality lab VOM and rechecked the resistances which were "out" previously. They tested essentially the same (HF cheapie meter was within 10% of the lab one). I also ran these same tests on a known good ECM (in my project CRD), and got the same resistance numbers as I got on the ECM which is throwing the P0340. My conclusion here is that the FSM is just wrong for these tests; it may be a bit extreme to make that statement, but given that I am measuring the resistance the same on a known good one and this one, not sure what else to conclude. FWIW, the tests in question are step 15. of the P0340 diesel diags, page 9-921 in the 06 FSM. I consistently read ~5k ohms resistance on this measurement and the FSM would have me replace and reprogram the ECM. And step 12, pg 9-920, where I read ~11K ohms. If someone can point out how I am misinterpreting things here, I'd like to hear it, but I think this test is telling me the ECM is OK, in spite of what the FSM may say. Still waiting to get an oscilloscope and look at the cam sensor waveform, so it is possible that might show something. But right now I am leaning towards the Tbelt timing being off and/or its tensioner being loose or mal-adjusted letting the timing slip out the window every so often. Way to check of course is to put the alignment pins in the cam shafts and crank shaft and see if they line up (of course that may not show if the tensioner is off and letting the timing move under load). I know how to do this when replacing a tBelt, but am trying to figure out if it is possible to check these without going as far as pulling the whole front off and accessing the tBelt. Looks like one could get the intake cam pin in if you just pulled the alternator. Not clear on the exhaust cam. I did not see any writeup or vids on doing a check (just all the ones for full replacing the tbelt). Any of the experts out there have any suggestions? What is the minimal disassembly one needs to do to just check the tbelt alignment? Stupid question maybe but have you checked the wiring harness behind the Fuel Filter Head Mounting Bracket? It is a known problem that the 2006 CRD can have the harness shorted to chassis behind the bracket. What is the minimal disassembly one needs to do to just check the tbelt alignment? rotate engine until the crankshaft dimple is at 3:00 and insert the crankshaft alignment pin or use a 6mm allen wrench. then see if cam alignment pins will screw into their respective holes on each camshaft. I was aware of setting that notch to 3 o'clock for getting the crank at 90 ATDC. However that notch is hidden (I think) until one pulls the crank pulley. Maybe you can see it behind the pulley from the side, I haven't gone down to check yet (still waiting for some nicer weather to do this). So fairly minimal "disassembly" this way, just the serp belt and crank pulley need to come off. I was hoping there was another way to position the crank (if you didn't mark which bolt is the one by the notch that is), without any disassembly. I was thinking that assuming the cam pins both go in at some point in the rotation, one could then check to see if the crank pin goes in. Sort of a test, but given all the other holes in the flex plate, its certainly not as conclusive. Alternatively seems one could pull #1 injector, and use a rod to determine TDC, mark the crank pulley bolt that at the top in that position, and move that bolt (and the notch) to 90 deg. But pulling an injector is probably more work than the crank pulley. I was just hoping someone here has found a quicker easy crankshaft position check. But your method may be the least work. I would look down oil fill tube while rotating crank you can see the cam dimple come around then rotate more till cam pin goes in . The bolts on crank are essentially markers for the crank notch so one bolt should be at 3 o clock you just don't know which one. then check the flywheel hole. 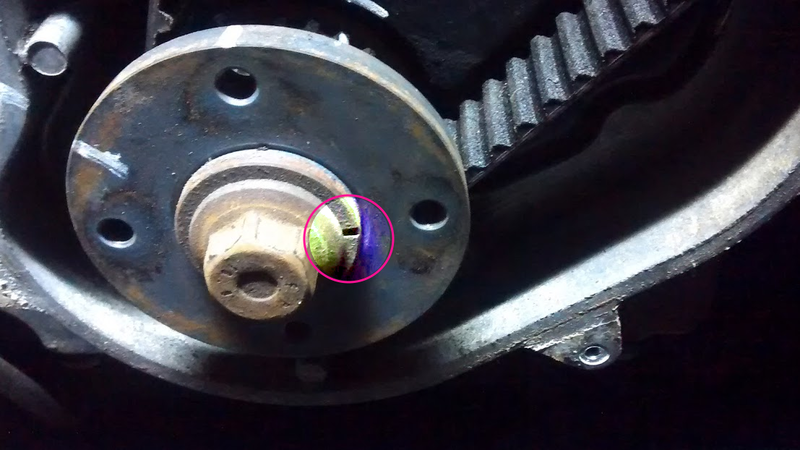 I suppose , once you find correct bolt either by checking it this way or removing tb cover etc while servicing you could mark the bolt position on the pulley and put that bolt in the 3 o clock poaistion for future reference. personally I have found it to be that much trouble to pin cams with crank. You may have to crawl under jeep a few times. Checking the flywheel hole lineup is easy if you have a scope to look in the hole, or are clever with a flashlight and mirror. 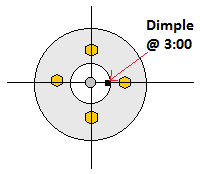 The hole for the timing pin is unique and recognizable from the other positions that your crank pin tool can go into. Thanks all. Looks like a good way to do it. Get close by seeing the cam hole in the oil filler tube, turn until the cam pins go in, then check the crank alignment hole. Intake cam might even fit without pulling the alt. Now I just need to wait for slightly better weather...hopefully in a couple of days. Had some decent weather today (before the next snow), so I tried the alignment test. Did have to remove the alt to get clearance on the intake side. And pulled the fan/shroud to get a wrench on the crank to turn things around. Basically appears to be in time, cam shaft pins both go in and crank hole was aligned with a tiny tweak to the crank position. The only thing which wasn't textbook perfect was the exhaust cam pin just would not go in that last 1/8" or so by hand (did not try tools). Even with the other alignment pins out, there did not seem to be a position which allowed this exhaust pin to go in further (it has threaded in all the way on other engines). From "playing" with this pin on an intake on a bench, getting threaded that far in should mean the pin was in the hole. One tooth out either way and the pin is 3/8" or more out, so it was hitting the hole. But might mean some misalignment (I suppose the PO's tbelt job guy could have tightened the cam sprocket a partial tooth off)? My thoughts here are that since the timing seems good, that I can probably rule out mechanical issues. I suppose it may be a bad tensioner or a stretchy belt or some other fairly rare mechanical thing, but with 12k miles on this tbelt job, I would hope those are pretty unlikely. What do folks think. Anyone with experience on more of these engines care to comment? Are things "fishy" enough that I should be taking off the tbelt cover to check under there, or is the more likely an electrical/electronic issue? @billybob- good thought. I did look behind the fuel filter at the wires back there when this first started happening about 6 mos ago. Did not see any obvious fraying or wear. But once I rule out the mechanical stuff, that will be high on my list of places to check again. The only way to eliminate a suspect connection of say the Cam Sensor to the ECM is to totally cut off the wires at both ends....and also Splices if they exist on that path and connect brand new wires joining the Cam Sensor to the ECM connector pin..and the splices if they exist. I will have a look at the circuitry. Doing this cuts out all connectors in series with the route of the wiring and any areas where the wiring could be fraying to engine/chassis or fraying to another random wire! I have mentioned this many times before but please bear with me. After my GF front-ended a tree that jumped in front of here with my 2002 Export CRD I had about 9 instances of weird wiring problems eg. turn on the front wipers and the battery voltage would slowly rise up to 17 volts at which stage the engine cut out. Turn on the Air-con and similar things happened. Unless I disabled the glow plugs likewise weird problems occurred. The wiring harness does not join points A and B together via the shortest route but runs right around the engine bay like the beltway around Washington DC....only place in USA I got to visit! This means it goes through various connectors and in the case of my old CRD goes through a metal channel up front where the crash damage occurred! So I could tell by use of my Fluke Multimeter that even if I disconnected every item on the line to the front wiper for example I was still getting a partial leakage to chassis/engine somewhere up front where the damage occurred. So I had to cut off all ends of that wiring route and fit brand new wires to connect all the points together again...taking the shortest route at all times. Did this for the 9 problems I had which showed themselves one by one over a few months! I then marked my changes on the relevant printouts of the wiring diagrams and keep them under the front seat for the next owner of my KJ to find if he picks up any wiring problems....much to expensive for me to replace the complete harness assembly! I don’t know what diagnostic steps you’ve already done but here is what I would do. 1. Key on engine off. Pull the plug to the cam sensor. Do a voltage check at each pin. One should be 5v. The other 0v or something less than 5v. If not 0v take note. 2. 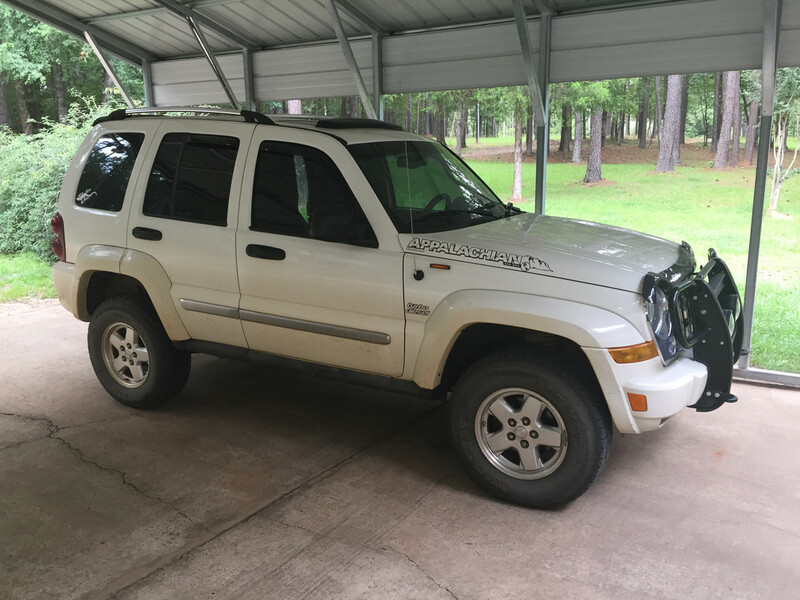 Remove the battery and ECU. Refer to the manual for which ECU harness pins are for the cam sensor. Jumper the two pins at cam sensor connector. Measure resistance between the two pins at the ECU harness connector. Should have continuity and less than 2 ohms. 3. Remove the jumper and plug the sensor back in. Measure continuity and resistance between the two ECU harness pins through the sensor. 4. Normalize everything. All things installed and connected the way it should be. Read the codes. Take note of all codes and then clear the codes. Disconnect the cam sensor and jumper the two pins. Key on, then remove the jumper. This will create a short and should set a new code. Hopefully something different than p0340. Read codes and take note. Then clear the codes. 4. Key off, normalize everything. Start engine and test drive. If CEL come back on, read codes. Flash- That is more or less the process I have followed on this, over a long time. Resistances were all good, some connectors were questionable-they were replaced/cleaned. However all this was spread out over a period of many months, since many of my fixes (cleaning contacts, replacing the sensor connector, etc) seemed to work for 100's of driven miles making me think it was fixed. I haven't tried intentionally shorting out the sensor leads and seeing what code get create, but since there are only two related to the cam sensor codes (0340 and 0344 which is the intermittent version) in the FSM not sure that a direct short would show anything different, at least from Torque and my OBDII reader, maybe on a DRBIII. Billybob- sounds like that crash created a real nightmare. And like you, I may be chasing a few hidden bad wires somewhere, I am just not entirely sure yet. What I was hoping the experts here could comment on was my previous thought that even though the exhaust pin would not go in the last 1/8" the TBelt alignment is good. Although I have done a few Tbelts and chains on other engines, I am still a novice on these CRDs. I don't have the experience to say "hey a pin not going in the last little bit is pretty common" or "that's the problem you gotta reset that tBelt timing". Either seems possible to me, with what I am seeing now. Knowing what the timing window the ECU has for the cam would help too. I plan on playing around with the intake manifold on the bench some more to get a better estimate of how many degrees off would cause the pin to bind 1/8" out. And when weather permits checking to see if with no other pins that exhaust cam pin can go all the way at some rotation (also may yield an estimate of degrees off), if so it would be definite that the ex cam is timed off a bit. So what do the experts think? Should I be looking closer at the exhaust cam timing, or lay the mechanical stuff to rest and pull out the VOM again? All thoughts, theories, ideas appreciated. So, with the key on, what were the voltage readings at the two pins of the cam sensor connector? If they were both 5v, there is a short in the wiring. I just want to make sure that has been ruled out.